When I moved The Shoe Hive to South Fairfax Street from South Royal Street in 2009, I was terrified to leave. I loved my block and I still think 100 South Royal is the best side street in Old Town. I am just happy I am still so close. 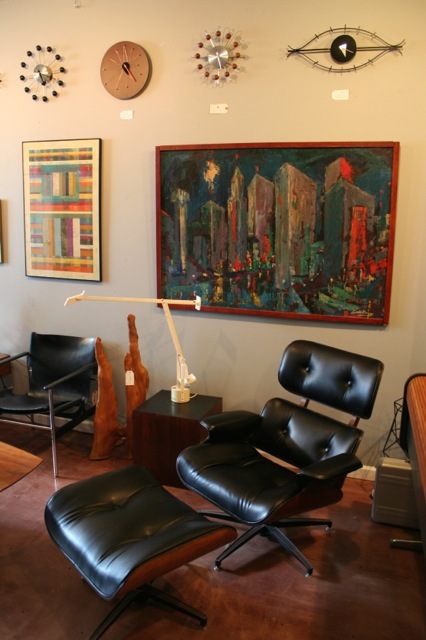 Thanks to the arrival of Acme Mid-Century Modern at 128 South Royal Street, things got even better. I met Pierre, the owner, at a new members meeting for the Old Town Boutique District. He is as sweet and charming as his store. 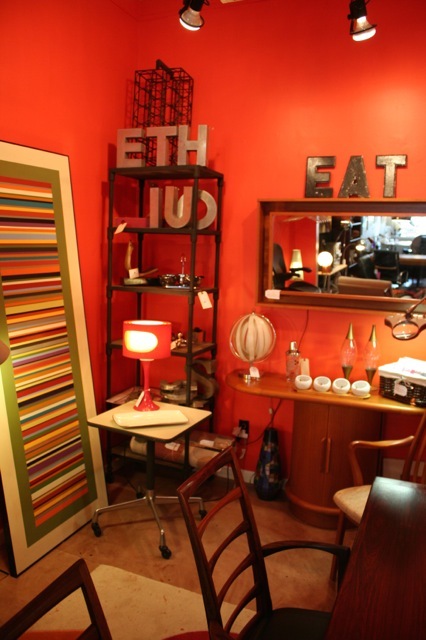 The store is fIlled with furniture, home accessories and art that is both vintage and new. You will not be disappointed from the moment you arrive. Not only is the space filled with great lines like Herman Miller and Knoll, he will also make you a great cup of coffee! We aren’t talking out-of-a-plastic-tub Maxwell House coffee either; we are talking espresso! Besides loving beautiful interior design he is also connoisseur of great coffee. So stop and welcome Pierre to the neighborhood. How long have you owned Acme Mid-Century + Modern? I started Acme Mid-Century + Modern about 5 years ago. 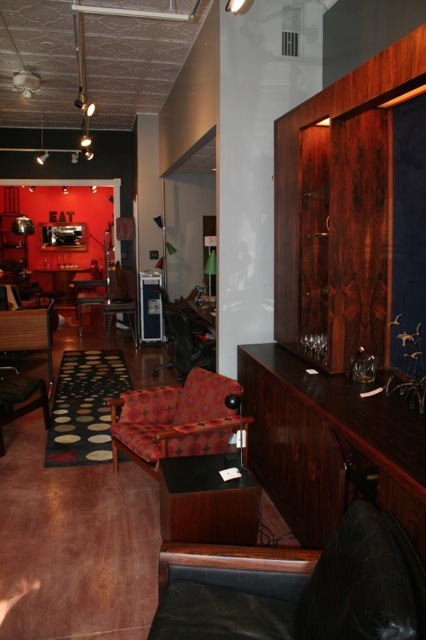 My first space was a 10’x10’ rental space in the basement of an antique/consignment store in Del Ray. I rented it with the idea that it would almost be like an extended yard sale — a way to get rid of some of the stuff that was starting to clutter my home. It was a great way to start, since I did not need to physically be there for things to sell, and only an initial three-month commitment. Over time I expanded into several additional spaces, and it started to turn into a business. Tell us what we should expect to find when we visit your store. I have an eclectic mix of inventory at Acme. I did not want to limit myself to mid-century modern items from the 50s through the 70s, thus the name of my business — it is Acme Mid-Century Plus Modern. This gives me the ability to add select contemporary and modern items, as well as classic designs of the mid-century era. We carry furniture, art, lighting, household goods, collectibles, and interesting vintage items, as well as some salvaged/repurposed pieces (one of the most popular being salvaged airplane galley carts, which my clients have used for everything from a bar unit to a supplemental kitchen island/storage unit. And walking though Acme’s doors, you may also expect to be greeted by the scent of espresso, of course! Why did you decide to move your store to Old Town? I was actively considering several locales, but Old Town has the best atmosphere for shopping and dining, and provides an interesting mix of locals and tourists. 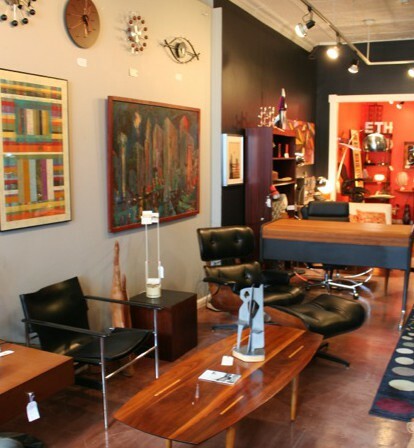 Some people thought it unwise to open a store focused on mid-century and modern items in the hearth of historic Old Town, but it turns out many people are aware that a more modern items can fairly easily be integrated into an antique or classic setting. What is your favorite piece of furniture in store right now? My favorite piece of furniture right now is probably the modern George Nelson roll top “Action Office” desk I have for sale. Dating from the 70s, it combines a classic tambour top with a very modern base and functionality. That’s my favorite piece that’s for sale — my favorite piece that’s not for sale is the Eames-designed 10-foot surfboard-shaped conference table I use as a desk in the shop. This piece, made by Herman Miller, gives me plenty of space to spread out my work and also sit down with customers to comfortably go over interior design ideas, color schemes, furniture and other options. What is your favorite place to dine in Old Town? My favorite restaurant in this part of Old Town is probably La Tasca. Especially when they have one of their all-you-can-eat tapas specials! Overwood is another favorite, just a few blocks away. If you were not involved in interior design, what would you be doing? I do keep busy with a couple of other things I do. My primary work is as a lobbyist for a non-profit, which is why my shop is only open Friday evenings and weekends. I am also a private investigator — the Acme Detective Agency — but have been less active in this field the last couple of years because of time limitations. I like the variety of various types of work, and enjoy it all!